MBK Food and Entertainment Company Limited administrated THE FIFTH food avenue, food court 5th floor at MBK Center Department Store which choose premium Thai restaurant for excellent service and taste serve to customers. Customers group: focus on worker group and domestic and foreign tourists who enjoy a various type of products and convenience service. THE FIFTH Food Avenue, New definition of International Food Hall is opened since May 2006 under the concept “Best place to dine, Ultimate place to chill out”. THE FIFTH cover the area over 2,600 square meters and 500 seats with ethnic food for example Thai, Italian, Japanese, Vietnam, India, Veggie, Arabic, Greek, Teppanyaki, Seafood and European-Fusion. Furthermore, THE FIFTH also created multi activities and event such as mini concert, chef table show, cooking show and meet & greets, etc. 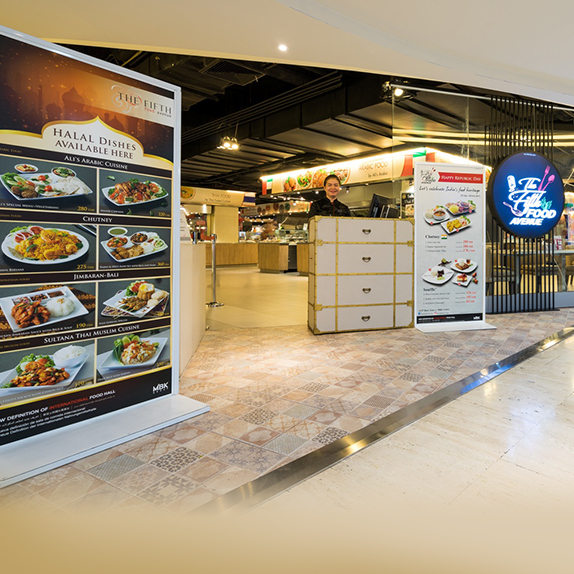 Let’s come and enjoy us daily 10 a.m. – 10 p.m.
Concept The FIFTH New Definition of International Food Hall Superb International food with more than 20 types of food awaits you at the welcoming and relaxing hall and entertains you with the cool jazz music and band.